A Bronx man who escaped from police in northern New Jersey while handcuffed is back in custody of the police who arrested him. Jose Rodriguez, 26, waived extradition after a day of leading police on a chase to Montville, Connecticut, where he was captured on Thursday morning, authorities said. The U.S. 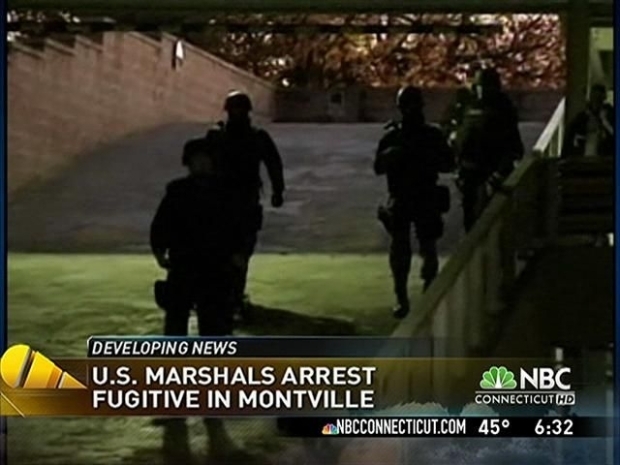 Marshal's Service took Jose Rodriguez, 26, into custody at the Mictrotel Inns & Suites in Montville, Connecticut, around 3:30 a.m. on Thursday, State Police Sgt. James Powers said. Rodriguez, who was shackled in handcuffs, managed to drive off, using his knees to steer an unmarked police vehicle, after he was apprehended in Fort Lee, New Jersey, on Wednesday, authorities said. A fugitive from the Bronx was captured in Montville after escaping and driving off with his knees. Police said he maneuvered to get his handcuffed hands in front of him and eventually picked the lock, freeing his hands and leg shackles, then abandoned the car. Rodriguez was wanted on a parole violation and drunken driving charge. He was also a suspect in a shooting this month in the Bronx. The escape caused a 25-minute lockdown of a Fort Lee elementary school. Rodriguez appeared in a court hearing in Norwich.